The initial launch of STS 51-F on 12 July was scrubbed at just T — 3 seconds with all three main engines up and running. A coolant valve in engine No 2's hydrogen chamber failed to close and the redundant safety system triggered an abort. They finally launched on 29 July, but barely five minutes into the mission, one of the three main engines shut down due to a failed sensor. By dumping the fuel to lighten the load, the mission made it to orbit on the other two engines, but fifty miles lower than planned. As a result, significant reprogramming of the experiments was needed, by controllers, investigators and the crew, in order to get as much scientific data from the mission as possible. The mission was extended by one day to gather more data. Spacelab 2 carried fifteen experiments in seven scientific disciplines, including three solar physics experiments, one in atmospheric physics, three in plasma physics, two in high-energy astrophysics, one in infrared astronomy, one in technology research, two in life science, and four smaller experiments. 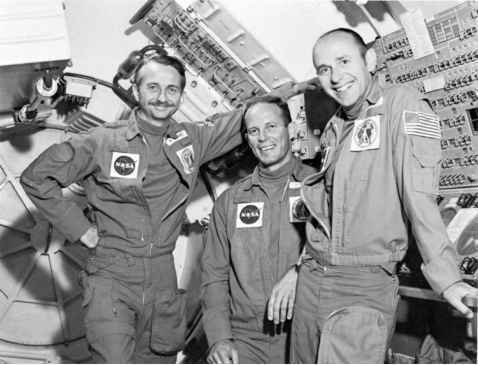 The mission did not feature a pressured laboratory module, as flown on Spacelab 1 or 3, but instead carried three pallets to support the experiments, as well as the instrument pointing system and an "igloo" containing instrumentation for data collection, commands, and thermal control. At the conclusion of the mission, and with eighty per cent of the pre-flight objectives met or exceeded despite the early setback, Jesse Moore, Chief of the Shuttle programme stated, "This may be the most exciting science mission the Space Shuttle has flown, and we're delighted with it.'' The crew had taken thousands of photos, forty-five hours of video tape, and 370 km of data tape. The flight landed on 6 August 1985 after a mission lasting 7 days 22 hours 45 minutes 26 seconds and 127 orbits.